Happy Friday Dolls! I'm so ready for the weekend! This week has been a pretty busy one for me. I'm ready to sit back and relax. Check out my list of Friday Faves that includes a dress to die for and a fun recipe to try out! First, I am OBSESSED OBSESSED OBSESSED with this dress from Dorothy Perkins S/S 2012 line. It's STUNNING! If anyone knows who-what-where-when I can find this baby----> PLEASE let me know! Next, have you seen Claudia Schiffer's new campaign for Guess?! She looks amazing! I love how the campaign has a retro feel. The line launches in Guess stores, Macy's, and online in April. 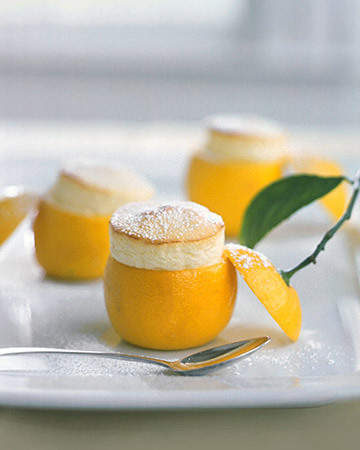 Another thing I'm in love with the this week are these great mini lemon soufflés! I found the recipe on Pinterest and it looks pretty simple and oh so cute! Going to try them out this weekend! 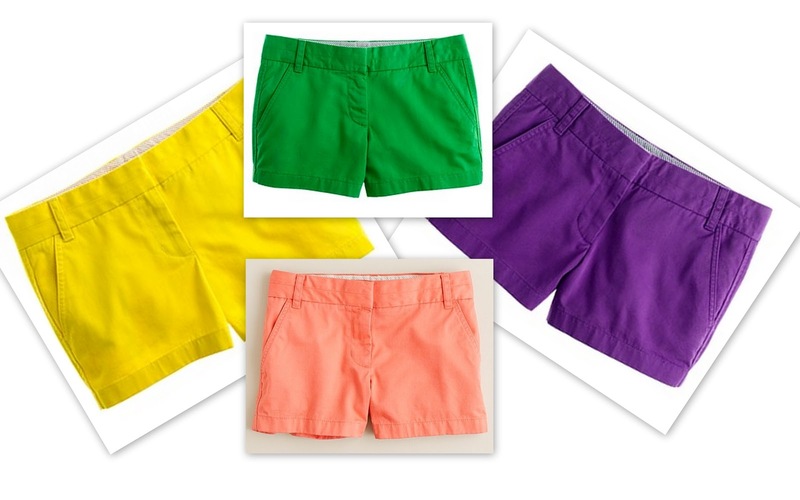 I also can't get enough of these colored chino shorts from JCrew! They are soo fun! They have pretty much every color in the rainbow and they're chic to boot! I may have to break down and snag me a pair---or two! Last, but not least, how adorable are these red polka dot Mary Janes?! Wouldn't they look great with rolled up skinnies and a blue blazer?! Hope you lovelies have an amazing weekend! Anyone have any special plans!? I was going to say the dress was my fave until I saw the shoes! LOL! Love your picks Giovanna! Those shoes are so awesome! I'm so excited they've brought back the Mary Jane's in so many fun colors and patterns. Love love love it! Giovanna I can't get enough your blog! SO friggin' cute! 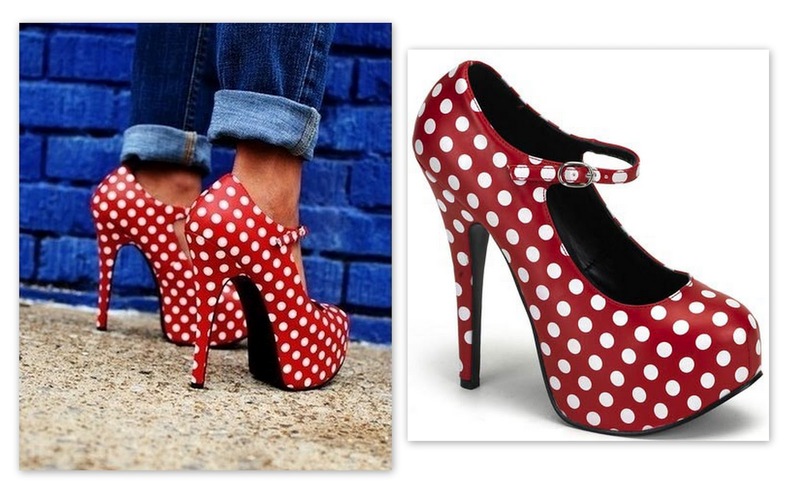 I want those polka dot pumps! Thanks again for stopping by my blog/following! Hope your enjoyed my Mint Chocolate Oreo Cupcake post! Following you now :)! That maxi dress is to die for - what a perfect pattern, and the open back is gorgeous! Yummm that lemon souffle looks delish! I also cant get enough of jcrew anything! Um pretty sure I need that first dress!! SO fab!! Wow -- Now I'm obsessed with that dress too. So gorgeous! wow!!! the lemon soufflé looks delicious! I'm kinda seriously stalking you now I mean any girl that can spot a good maxi and a cute sweet treat, I'm totally on board with! dots, pretty babes and good food! lovely! happy weekend! :):: enjoy! Great post! Love it! Thanks for the comment on my blog and I'd love it if we could follow each other?! OMG that first dress in AMAZINGGGGG!!!!! Oh wow, that dress is amazing! Those lemon soufflés are so cute! I love the maxi dress in the first photo; it's stunning :) The colorful shorts are super cute too! Beautiful dress! We love the polka dots prints of the shoes too! Super cute! this dress from DP is really gorgeous!!! thx for left a comment... Do you want follow each other?? love the long dress dear!amazing!! wow that maxi dress is fabolous!!! I like the pretty dotted red pumps! it goes perfectly well with jeans or dress! Such a great post, I really like it, the long dress is really nice! Super post!I have the red shoes! Oh that really is such a gorgeous maxi! And those lemon souffles look delicious! I've tasted them in restaurants, but have never been daring enough to make them on my own! And I've been eyeing those J.Crew shorts in nearly every color...great pick! That dress is PHENOMENAL! You have discerning taste....I am obsessed with everything in this post :). I love how the retro Guess ad is classy...some of their ads can leave little to the imagination, the retro ads are much more intriguing! love this post! so much good things. that top dress is to die for!!! Hope you're having a nice weekend! oh wow those red dotted heels are incredible absolutly love them did you buy them? Very nice blog btw I love your layout and design with the twitter, bloglovn buttons and so on very cool! Did you make that yourself? I'm in love with the first dress, gorgeous!!! Red dottle heels are totally incredible!! That DP dress is gorgeous. first dress, polka dot shoes, and colorful shorts are my favorite. nice picks!